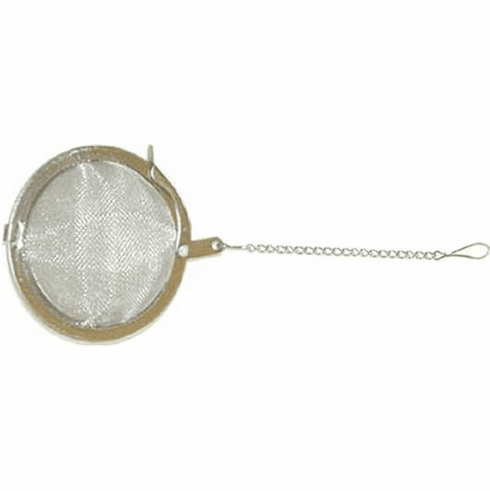 The 2 and 1/2 Inch Mesh Tea Ball is ideal for containing tea leaves during the steeping process as a self contained infuser. This tea ball is 2.5 inches (6.4 cm) in diameter and is made of stainless steel. Its clasp is easily open or close and stays shut during steeping process to make sure that no loose tea leaves are dispursed into the cup. To use the tea ball, spoon the tea leaves into it, close it and place it into the mug or teapot. Pour hot water over the tea ball so that it can steep. After 3 to 5 minutes, remove the tea ball to enjoy a good cup of tea. Tea leaves may be steeped multiple times. Shipping weight is 0.07 lbs. Out of stock.